Istanbul is a gold mine of street food varieties for millions of people commuting back and forth and needing to have something to eat on the way to work, school etc. Any time of the day you can find something to eat on the street in Istanbul. Breakfast, lunch, dinner or even food eaten late at night after leaving the bars, pubs or clubs. A kind of circular bread covered with sesame. It is very popular in Turkey as well as in the countries in Balkans and Middle East. Also it is called gevrek in Izmir. Simit is sold on the street by the street vendors, at simit sarayi (simit fast food restaurants) and at the bakeries. It is consumed as fast food and for breakfast. It is usually eaten plain or with karper (a kind of cream cheese) for breakfast or with cheese, sucuk, sausage, and olives for both breakfast and other meals of the day. Needless to say, simit best goes well with a glass of Turkish tea! A kind of tightly packed meat roasted on a large vertical spit and served in half bread or pide with salad, known as döner kebab worldwide. Döner comes from the verb dönmek (to turn, rotate, spin). Döner is usually served as sandwich as well as topped on rice (pilav üstü döner) and Iskender Kebabı (thinly cut döner basted with tomato sauce over pieces of pide bread and slathered with melted butter and yoghurt). A kind of savory bun that is usually sold with simit and çatal on the street. A kind of cold sandwich made with cheese, sausage, sucuk, pickels, ketchap and mayonnaise between two big slices of bread. Ayvalık Tostu has become very popular in the big cities recently. The reason why it is called Ayvalık Tostu is the sandwich bread made with chickpea powder and yeast and of course, it is originally from Ayvalık, a town by the Agean Sea. A kind of fish sandwich that is usually sold by the seaside, mostly in Eminönü, Kadıköy and Üsküdar. It is quite cheap and served in a half loaf of bread with lettuce, onions and lemon juice. A wrap made of lavaş or yufka flatbread used to serve döner, kebab, tavuk, köfte, sucuk e.g. Adana dürüm, Urfa dürüm, tavuk dürüm, sucuk dürüm etc. Dürüm shops are usually open until the morning because Istanbulians coming from bars or pubs stop at dürümcü shops before going home. A kind of thin börek cooked on a sheet iron. It is also called bazlama. Ispanaklı gözleme gözleme with spinach kiymali gözleme gözleme with minced meat patatesli gözleme gözleme with potato peynirli gözleme gözleme with cheese. A kind of hamburger. It is called islak (wet) because it is kept in a heated, steamy shopwindow. It is also called Taksim hamburgeri because it became popular in the shops in Taksim. Kokorec, a Greek word in Turkish, is a Turkish dish of Balkan origin made of seasoned skewered lamb intestines. Kokorec is served either a bread sandwich or a dish at the restaurants, with chopped tomato, pepper, thyme and usually drunk with ayran, turnip juice or beer. Beside the fastfood restaurants in Istanbul, it is sold on the streets by street vendors. According to popular belief, kokorec is one of the foods that alleviate hangovers if consumed after drinking. It is quite possible to see people around a small kokorec car eating kokorec late at night after drinking in Taksim, Kadikoy etc. Try kokorec if you haven’t. It’s not bad as it sounds. 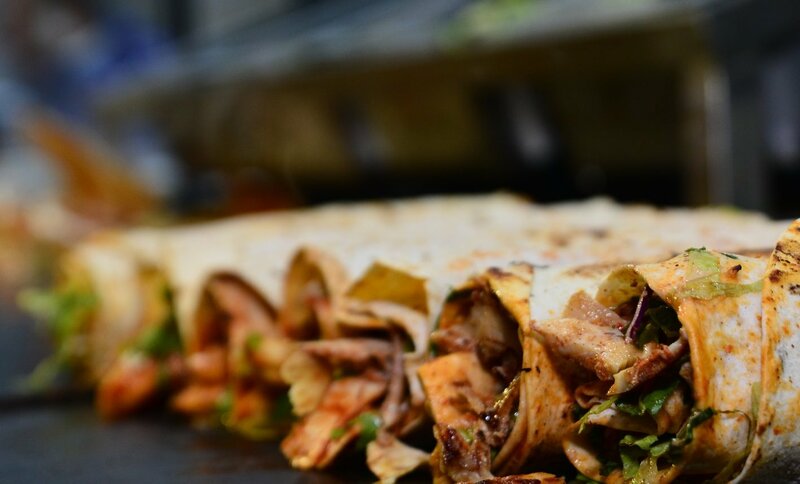 It’s one of the top street foods you should try in Istanbul. You can go to Mercan or Sampiyon (restaurants) in Beyoğlu or Kadıköy and have a yarım ekmek kokoreç and a beer. A kind of rolled börek with cheese, minced meat or potato and cooked in the oven. Kol böreği is one of the most popular quick breakfast foods. With tea, of course. Baked potato served with butter, cheese, ezme, olives, corns, peas, sausages, salami etc. Ortaköy is a nice place to go for a walk with a nice kumpir and ice cream by the Bosphorus. 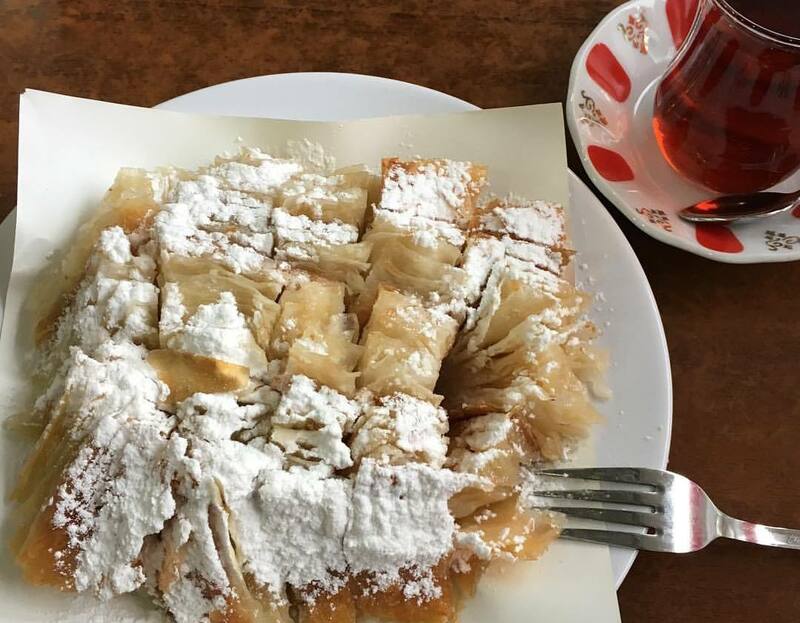 A kind of plain börek served with powder sugar. 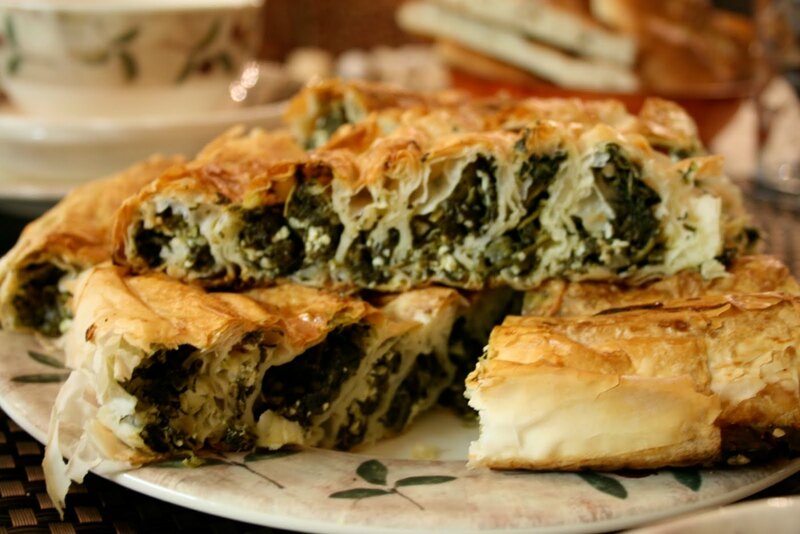 One of the börek types sold by the street vendors and börek shops that Istanbulians loves to eat as fastfood. Lahmacun is a kind of round or oval thin piece of dough topped with minced meat, onions and spices. Lahmacun is served with lemon slices and vegetables. It is wrapped around the vegetables like tomato, lettuce, onions and parsley. There is also a small type of lahmacun called fındık lahmacun served as appetizer before main course, usually kebab meals. Istanbulians usually consume lahmacun with ayran. Stuffed mussel made from rice, pine nut, raisin, onions and various spices. It is boiled and served cold with lemon. It is sold both at restaurants and by street vendors. A flaky, savory pastry with cheese, minced meat, potato, olives, dill. It is usually consumed for breakfast. Poğaça is a very popular food with tea and sold at the bakeries or büfe. Common types of poğaça are kiymali pogaca pogaca with minced meat, patatesli pogaca pogaca with potato, peynirli pogaca pogaca with cheese. 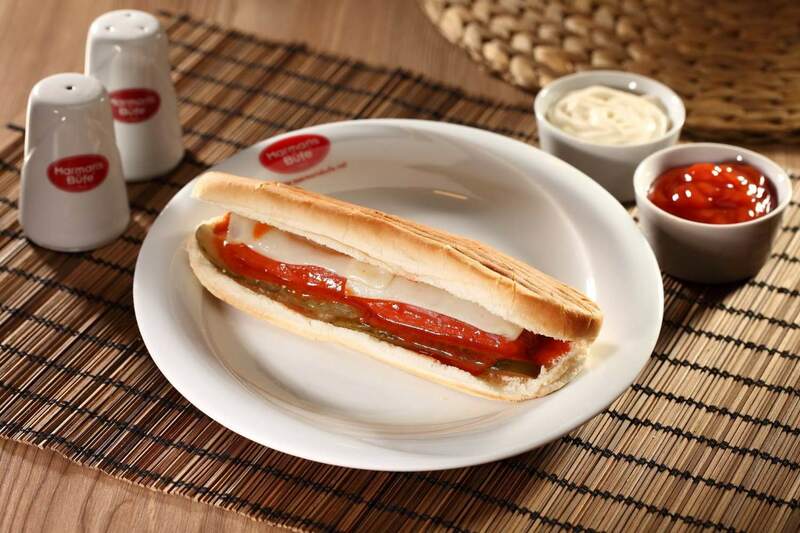 A sandwich with sausage, hotdog, short way of saying sosisli sandvic (sandwich with sausage). It is served with mayonnaise, ketchup and cucumber pickles. Some Istanbulians prefer it with Amerikan (Rus) salatasi (potato salad). 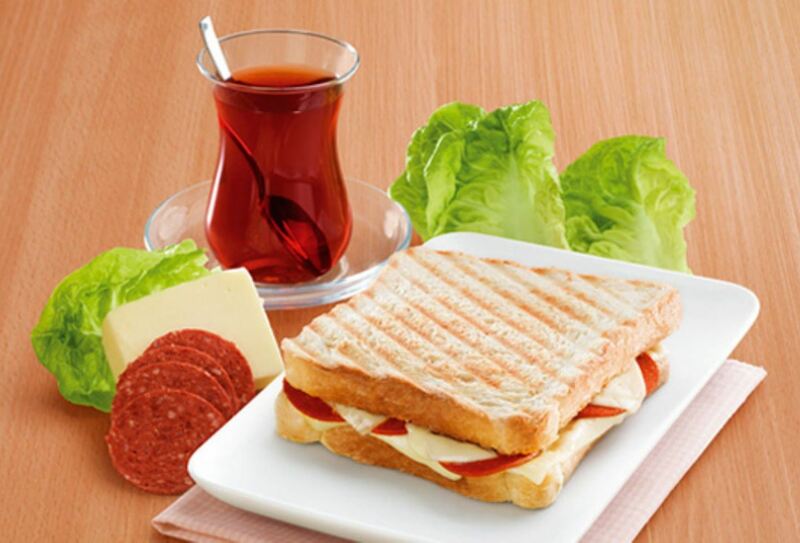 Toasted sandwich usually made with kaşar cheese and sucuk (spicy Turkish sausage). This kind of sandwich is usually consumed with tea or ayran. You can find street vendors selling fastfood all around the city. Plus there are bufe, a stand or counter on the sidewalk where drinks, food, and sundries are sold. They are located especially near the ferry stations or by the sea. Regarding the fact that Istanbul is a very crowded city, büfe is very important to meet the everyday needs of the dwellers. Simit Sarayi A fast food restaurant where simit products and other fast food are sold. Simit fastfood restaurans have become popular very recently. They serve a wide variety of simit products such as plain simit, simit with cheese, olives, sausage, sucuk, mixed simit as well as cookies, poğaça, açma, and döner. Things to do in Istanbul – Like a local!